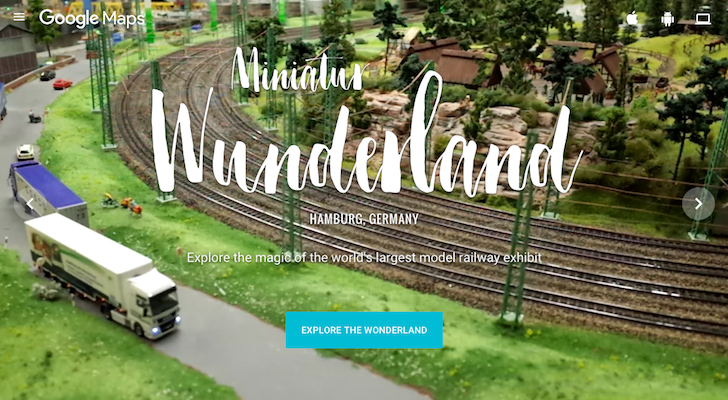 Google Street View has been on many expeditions through time and through our planet, from the Amazon to Greenland, from the Philippines to Jordan to Machu Picchu, but no mission has been as cute as this exploration of the world's largest model railway in Hamburg, Miniatur Wunderland. It's an exhibit of a tiny world with tiny buildings, 13000 meters of tiny tracks and tiny things with more than 200000 tiny citizens doing what they do. Everything is interactive, the lights change with the day, the trains move, the planes lift off, the fair rides turn, the people dance and bike, and the nature and surroundings are as much of an honest replica as they can be of the real thing. In order to explore this world, the Street View team had to build a new miniature image capturing rig in partnership with Ubilabs and use it to ride the streets and railways of the Wunderland to grab everything from street level. It even built a tiny Street View car to commemorate the project and placed it around the exhibit. To take a tour and feel like a miniaturized human driving around the world, visiting the Grand Canyon and Las Vegas, checking fairs and concert venues and farmer's markets, going to ski slopes and airports, head over to g.co/miniaturwunderland or directly to the exhibition's Street View location. Don't forget your D'awww, you'll need it.